For people who own fixed-income investments (like bonds or preferred shares), inflation is always a major worry. It eats away at your returns. For example, if you earn 4% in annual interest on a bond, but inflation runs at 5%, you've actually lost purchasing power. We don't want to see inflation rear its ugly head. And counter to what many people believe, I don't think it will any time soon. The mainstream media is starting to predict that inflation is heading higher... but I think the move could be smaller than most think. That's because producer prices tend to lead consumer prices, and the Producer Price Index (PPI) – which represents prices that producers pay for their input materials and supplies – is still subdued. 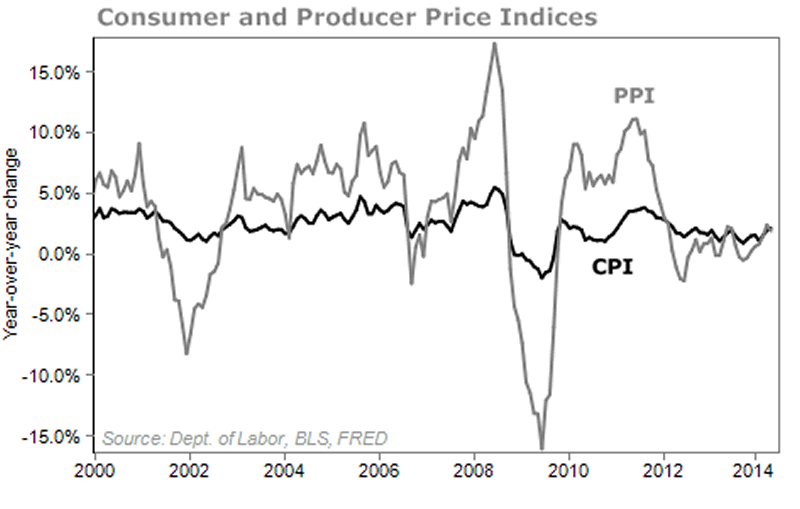 As you can see, the PPI is below the levels of the Consumer Price Index (CPI) – or the final prices consumers pay. The CPI trails the PPI, so we expect the CPI to head lower from here. And in today's situation – when the PPI is lower than the CPI and at low levels – it's a bullish sign for stocks, as companies enjoy higher profit margins. It's also good for bond investors. Therefore, I'm still telling my readers to buy fixed-income investments, such as tax-free municipal bonds. One of my favorite ways to invest in "muni" bonds, which I've discussed here before, is the Invesco Value Muni Fund (IIM). Right now, IIM is offering you a little more than 6% in annual interest. For those in higher tax brackets, the income you receive is equivalent to getting 9%-10% on your taxable investments. Even people in lower brackets benefit from getting tax-free income (6.5%-8% equivalent). Those yields are similar to what you can get from high-yield corporate "junk" bonds, which yield a little less than 6%, according to the Merrill Lynch High Yield Index. But junk bonds are much riskier, with default rates that have ranged historically from 1% to 12%. Plus, IIM is trading at an 8% discount to its underlying assets, which makes it an even better buy... It's like buying a dollar for 92 cents. With oil prices over $100 and the economy starting to chug along, many of TV's talking heads and the financial media would have you believe inflation is a problem. But the facts tell us otherwise. Don't let these worries keep you from making money. Hold on to your income investments and consider buying shares of a tax-free muni fund like IIM. As soon as the facts about inflation change, we'll let you know.